The Federal Open Market Committee decided today to raise its target for the federal funds rate by 25 basis points. The Committee believes that, even after this action, the stance of monetary policy remains accommodative and, coupled with robust underlying growth in productivity, is providing ongoing support to economic activity. The evidence accumulated over the intermeeting period indicates that output is continuing to expand at a solid pace and labor market conditions have improved. The Committee perceives the upside and downside risks to the attainment of both sustainable growth and price stability for the next few quarters are roughly equal. With underlying inflation still expected to be relatively low, the Committee believes that policy accommodation can be removed at a pace that is likely to be measured. Nonetheless, the Committee will respond to changes in economic prospects as needed to fulfill its obligation to maintain price stability. These were the words that ushered in the last Federal Reserve tightening cycle, at the equivalent meeting in June eleven long years ago. Despite the fears of the "taper tantrum" and "lift-off fever" over the last couple of years, it's quite clear that nothing like this sort of message will be conveyed in today's FOMC communique. The real nub of the issue, of course, is whether the committee will signal the possibility of a rate hike in September- or at least their willingness to do so. It seems almost inconceivable that the language of the statement wouldn't leave the door fairly wide for a hike in September should circumstances warrant; as such, markets will revert back to the much-discussed dot plot to get a real sense for how likely the committee thinks such a move is. Recall that at the last SEP in March, the median and mode of the scatter plot was at 0.625%, representing a 50 bp tightening from status quo. Two committee members sat at unched, while four were above 1%. 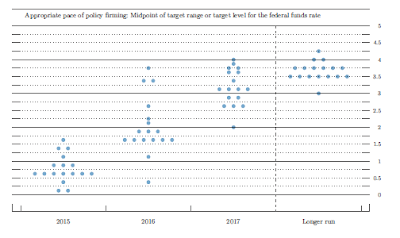 Those four will almost certainly be marked lower; regardless of where they think rates should currently be, the fact is that there's only 4 meetings after this one 'til year end, which only leaves time for so many hikes. Moreover, it's not as if the data has been gangbusters over the last few months, either. No, the real issue is what happens with the ten committee members who plumped for either 0.625% or 0.875%. It seems likely that some will move lower, but how many, and by how much? 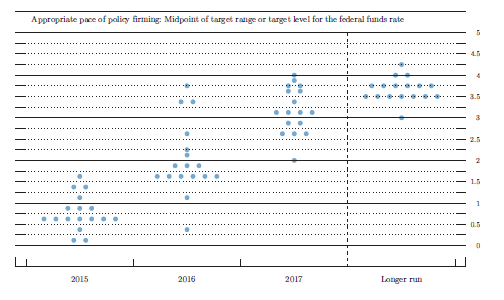 As has been the case for some time, futures markets are pricing less than is currently "forecast" by the dots; the January '16 Fed funds futures contract implies a FF effective rate of 0.415%. This is a shade under 30 bps higher than is priced for the month of June, so you'd have to say that there's not a massive amount more that these things can rally while still leaving a healthy chance of a hike this year at all. For choice, Macro Man would expect a few defections into the bottom tier of the plot, with the bulk of the remainder clustered into the rows consistent with one or two tightenings. How will markets react? Hard to say. The dollar hasn't exactly been running away, despite the ongoing nonsense in Greece. Indeed, being short euros is a bit like being a fan of the Pittsburgh Pirates these days. The team has spent the entirety of the time since May 23rd between 6 and 7 games behind the hated St. Louis Cardinals (who, like the Greeks, take a cavalier attitude towards the rules! ), despite going 15-5 over that period. Similarly, it seems like every time Macro Man looks at the euro these days, it's 1.12 and change- other than a brief foray lower right after payrolls. As for stocks, on an index level Macro Man remains apathetic and on the sidelines. In reality, this price action reminds him quite a bit of 2004, when Spooz went nowhere while hand-wringing over Fed tightening. (Amusingly, Macro Man recalls referring to the 'monetary methadone' of 1% rates back then- he didn't know how good we had it!) To be sure, European indices offer quite a bit more sizzle in both directions, though even there it feels as if there's still exposure to this Greek rubbish in the near term. Colour him uninterested. In the meantime, he looks forward to the day when he can read some text similar to that at the top of this post on the front page of the newspaper rather than the back end of a history textbook. I'm betting the market reaction will be the same as its been for almost all of the last 5 years - something along the lines of "WOW - they are more dovish than I thought". Dot plots lower and tighter, keeping the door open for 25 @ Sep but it'll probably not happen then either. 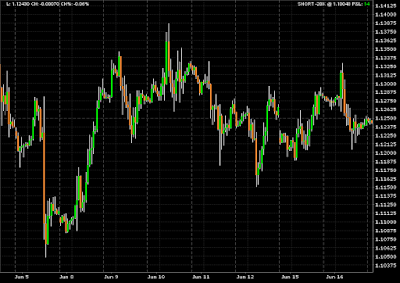 Long end & spoos rally, short end and DXY flat. Two rises of 1/8% each before year end. Macro Man!, I haven't read you in ages..what's doing old chap.You bumping and running these days..where I come from, I'd have to say, wait for the flick pass. I know where your getting your mail. And it ain't f%%kin Fedex! I actually expect that they begin to raise the market expectation right now, instead of right before September. FZucchi: Bloomberg just flashed headlines from CALPERS CIO stating that the giant pension fund is unlikely to meet its 7.5% return bogey for 2015. The inevitable consequence of such shortfalls is a more aggressive investment style in the future, combined with more incremental contributions from participants. Since pension investment committees want to have less and less to do with equities, let alone hedge funds, the extra money is likely to continue chasing leveraged bond funds and commercial real estate. As the fund managers continue to hand piles of monies to companies which sell the bonds, the companies will continue to have access to cash to financially engineer their stocks. Is it healthy? No. Will it ultimately prove insane? Almost certainly. But is it, and will it continue to happen until the fresh cash runs dry? You can bet on it. And that cash not only is not running dry, it looks like it's growing with every return shortfall. Generally my expectations for today are in line with MM's dovish dot shift above. Wake me up if something more interesting happens. We are still more interested in watching what the Treasury market actually does (mainly in response to European rates, for the time being) than what the FOMC actually says. Greek Panto season should have ended ages ago. "Look out, De Fault is behind you" "Oh no, it isn't" "Oh yes, it is" "Oh no, it isn't". Schäuble looks awful as a pantomime Dame. This has all become very clownish. Enough already, just compromise. So the dot plot for 2015 stays the same, yet EDZ5 rallies...Good thing I dont trade the short end for a living. The Short End is presumably saying, gooooo ooooonnn, we dare ya! LB isn't sure who is bluffing. a) The fed is more scared of market reaction than of whatever impact a rate bump would have on the real economy. b) They say they are looking at the data, well the data is plenty good for rates to be several hundred bp higher than they are. c) The benchmark data they want to see, such as unemployment levels, are unrealistic based on historical norms. Put these together and its just another round of 'lower for longer' with the fed taking all its cues from the market. EDZ5 was once again discounting a fed that would actually move rates. When they talk about "gradual", I interpret that to mean that after the first bump its going to be multiple meetings until the next possible increase. (Lets ignore that she said 04-06 was too slow). WIRP showing 100bp by 12/16 seems insane now. There is a fine line between "dovish" and "cornered". When we are sub-1500 SPX by Halloween, who will care what the krauts do about the gyros? They are all bust-outs! This thing is so jammed up because they are all married to each other and it costs more for a proper divorce. I've seen how this plays out many times before. "Perhaps if we sent the FOMC a copy of FM's body of comments it would spur them into action...."
MM - if by action you mean violent heaves followed by liquid discharges, then yes indeed. I confess I didn't understand the price response today - I daresay that ultimately the biggest problem for US equity bulls is not whether the Fed will keep throwing gunpowder at the problem, coz of course they will, but rather if the market doesn't notice or care when they do. Needless to say it was just one day after all - we will see if this will turn out to be the usual expiration moonshot by Friday - if not then something could be changing. Gotta love the whole 'in hindsight we should have raised faster from 04-06' - really Janet? That's like a chain smoking guy observing between puffs that his lungs would be so much healthier if he had quit smoking a decade ago. Macro Man, how'd you end up after the FED meet.I've been flicking through the financial pages lately and I decided to take a view of New York and London markets from the perspective of someone like you, that being someone that trades around the clock...and I laughed. New York and London are one big laugh.No wonder there has been a spike in trader kamikazes.It amuses me to think that I wanted to leave the beaches of Australia when all I have to do is reset the trend following program each day.Save your money mate, the markets are a laugh. "Whether it's September, December, or _March_." "I can't give an ironclad promise..."
Relatively strong reactions in the market indicators compared to the assumption that no-one was supposed to believe in the miracle of June anyway. I'm mentally setting September as the back door after which I'm finally willing to accept the notion of ZIRP 4-evah. But then again, maybe so does the market consensus. And provided the market indicators don't reverse by Friday night deep down inside the consensus isn't "really" a believer of September miracle either so it might be read as a pretty strong bluff front-running signal. No credibility is no credibility, that simple. Is anyone dipping into GDX? Am I upsetting people with all my correct market calls? Public appearance and affairs, they're all bust out! Mr T, I get that the Fed is probably going to wait and re-asses after rate hikes. What I dont get is why then do you keep the Dot plot the same. I guess the relevance of the whole Dot Plot project is dubious now anyways. Listen to what I say, not what I plot. I guess it doesnt help either when you have Ip and Hatzius every other day writing that the Fed should err until inflation is higher before going. 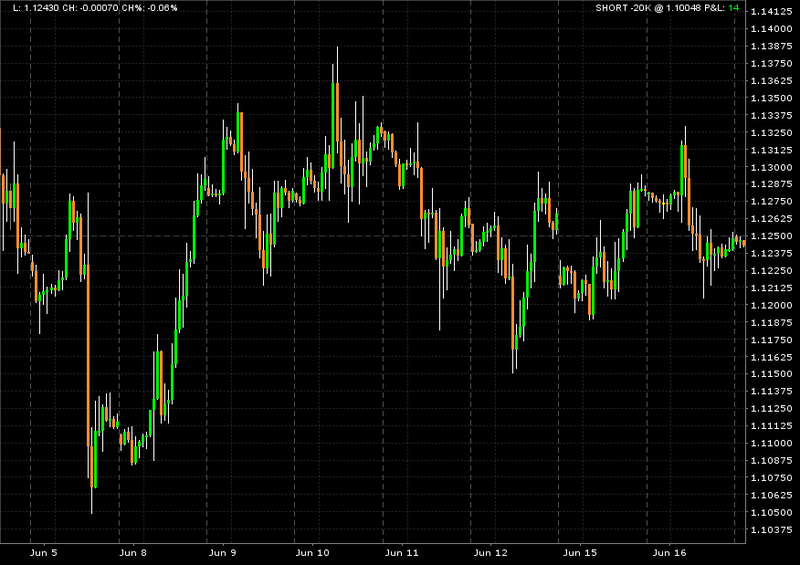 Either way, I will take my cue from the 5 year yield for when something game changing has emerged.